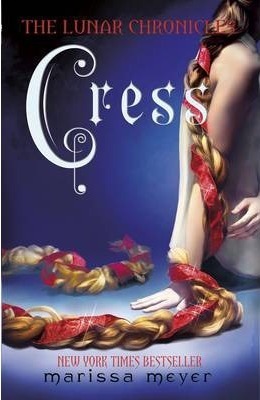 Cress by Marissa Meyer (bought) - WARNING! I cannot review this book without spoiling the others in the series. Read no further if you're planning on reading this series and don't want it spoilt for you. When a daring rescue of Cress goes awry, the group is separated. Cress finally has her freedom, but it comes at a high price. Meanwhile, Queen Levana will let nothing prevent her marriage to Emperor Kai. Cress, Scarlet, and Cinder may not have signed up to save the world, but they may be the only hope the world has. From Goodreads. I can't really begin to express how much I love The Lunar Chronicles by Marissa Meyer. With each book, it just gets better; the world, the originality, the effortless weaving of fairytales we know into a completely unrecognisable story that I just can't get enough of. Cress is no exception; the stakes are raised, the clock is ticking, and things get even more epic. I don't want to give too much away because so much happens, so I'm not writing a description this time round, as I think the Goodreads description is good enough. But oooh, this story is just so good! I don't know the original story of Rapunzel very well; I know she's locked in a tower, has very long hair, which is used to help a prince climb the tower. Otherwise, I'm in the dark, so I didn't have the same experience of recognition as certain parts of the story reflected the original. Even so, it was still bloody brilliant. As I said, things get epic in this story, and this is due to them being split up. Everyone is in danger, but no-one knows how the others are doing, if they're even alive. Cress and Thorne end up on Earth in the middle of a desert, with no life to be seen in any direction for miles. Because of the events of the botched yet partially successful rescue attempt, Thorne is injured, and Cress is struggling with being out of her satellite, with all the space and all the sky. Cress needs Thorne to keep her from drowning in anxiety, and Thorne needs Cress because he's injured. They both need the other's help, and it's difficult. Thorne needs to do some fast talking to keep Cress calm, and needs to really think in order to keep them alive, and Cress needs to keep a lid on her anxiety to help Thorne get about and follow his instructions. And this is all so, so wonderful! Seriously! Thorne is still Thorne; still arrogrant and funny and making a joke out of everything, but in Cress, he shows he's also very smart. Not only that, but he's great under pressure. He is so compassionate and kind and gentle with Cress, despite the fact he's struggling with his injury himself. He can't afford to freak out and worry about what's happened to him, because he's the only one who can keep them alive, because not only does Cress not know much about Earth at all, she hasn't been out of her satellite for seven years. She has no idea what to do. Thorne really steps up, and my admiration for him really grows. He's definitely the comic relief of the series, but he's also a fantastic character in his own right. There's a conversation he and Cress have; Cress talks about how she's always thought of him as a hero, because of the research she's done on him - there's always been some kind of altruistic motive behind his wrong doings. Thorne tells her she's got him all wrong, and those altruistic motives were made up to get him out of trouble - he's no hero. Except in this story, that's exactly what he is. And he's wonderful! I didn't warm to Cress as much as I hoped. I didn't hate her, I actually liked her, but I didn't warm to her as much as I warmed to Cinder and Scarlet. That might just be because she spent a lot of time with Thorne, who I completely adore, so my attention was more on him. Saying that, she's still a fantastic character. She's scared, she's really terrified - of defying her queen, of what will happen to Earth if Levana marries Kai, what will happen to her if she's ever caught, what will happen to her and Thorne in this desert, of the world itself - but she is brilliant. She's super intelligent, and all the time in the satellite has taught her to be an exceptional hacker. She's resourceful and smart, even when she's scared, and she's so brave. Courageous. She is scared all the time, but she still defies Queen Levana and Mistress Sybil. She takes action and works against them, despite being terrified, and you can only admire her for it. I have so much respect for her, and am in such awe. Which made me really just how wonderful the female characters in this series are. They're all based on fairy tale damsels in distress, but they're all so resourceful and smart and strong! When it comes down to the crunch, Cinder, Scarlet and Cress will always do the thing they believe is right, and show such bravery. Cinder tries to warn Kai at the ball that Levana will kill him; Scarlet goes off to find her grandmother once she's found out that she's been kidnapped; Cress goes against those who have only kept her alive for how useful she is. And not only that, but look at the jobs these ladies have; Cinder is a mechanic, Scarlet practically runs the business of her grandmother's farm, Cress is a computer hacker - all jobs that are stereotypically thought of as jobs for - and given to - men. These ladies are the kind of role models we need in fiction these days. They're not your typical damsels in distress - they may get into scrapes they need help getting out of, but they also do some rescuing of their own. These characters are women to look up to. This book is action packed, and packs one hell of a punch! Just as you think things are starting to look good, there's another obstacle, and another, and another. Characters are mourning those they believe dead, and trying to carry on without them, despite their grief. There's the huge, unbelievable build up to the end, and then that ending! Oh my god! I am so excited to pick up Winter, the fourth and final book in The Lunar Chronicles, but I'm waiting. I'm waiting to read Fairest, which I believe is a prequel to the series, from Levana's point of view. Apparently it's not crucial to read before Winter, but it gives an insight into the queen and can help, I've heard. So I've ordered it online, and I'm going to read that first. I am SO excited! And it also means the end of the series is put off a little longer. This series is absolutely incredible, and I really, really don't want it to end! I'm so glad I have two more full length books, and a short story collection, Stars Above, to read before leaving this world. I simply cannot get enough!